The Medical Center at the University of Maryland has more than 10,000 ID cards in circulation at any given time using the mag stripe for access, ID, and secure camera control in operating rooms. They are now using Zebra’s P420i printer for printing and encoding of these badges. Keeping up with technology is a major challenge for many hospitals across the country, not just in order to provide cutting edge medical care, but also for taking care of important administrative functions such as creating secure employee badges. The University of Maryland Medical Center (UMMC) is one example of a hospital that tries to stay at the forefront of technology for a variety of purposes. The medical center, a large teaching hospital in downtown Baltimore, has 669 beds with more than 1,000 attending physicians, a diverse staff of more than 6,000 employees, as well as volunteers and others who have business within the facility. The medical center’s legacy of combining cutting-edge medical research with innovative and compassionate care has been recognized for nearly two centuries and continues today. When the medical center sought a card printer to create its employee badges, it chose the Zebra P420i printer. The medical center recently replaced a Zebra P420 printer with the newer Zebra P420i printer to take advantage of its revolutionary i-functionality, which simplifies card printing via automatic driver configuration, intelligent color optimization and a special RFID system for ribbon image counter and ribbon low notification. “The printer is extremely reliable and is working well for us,” Sgt. Shanks notes. Reliability is critical to the medical center’s operations, as all employees, contractors and vendors are required to wear badges at all times on the hospital grounds. Since 1994, the medical center has printed its own encoded magnetic stripe cards, which perform a variety of functions. The magnetic stripe cards are used for access control, timekeeping functions, scrubs and linen control, and tracking exactly who has changed camera angles in the center’s operating rooms. Only authorized individuals can control the cameras, and this system enables hospital officials to know who is using them. 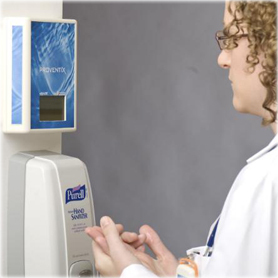 Magnetic stripe card readers also control access to sensitive hospital areas. The standalone P420i dual-sided color printer prints sharp, readable ID photographs, graphics, and text edge-to-edge in seconds. The enclosure includes a viewing window to monitor the printing process without opening the unit. The P420i printer ribbon synchronizes automatically, eliminating the need for operator intervention. A self-cleaning cartridge thoroughly removes dust before printing, eliminating card rejects due to dust contamination. The P420i features Zebra’s revolutionary i-functionality, which simplifies card printing via automatic driver configuration, intelligent color optimization and a special RFID system for ribbon image counter and ribbon low notification.